When he was hired at Google back in ’99, it was to create food that would energize people, stimulate them and introduce healthy, organic and sustainably-sourced food into their diets. That’s quite a lofty list – trying to persuade programmers and computer folk to eat well AND eat local. But Charlie made over the office cafeteria into a feast for the eyes and stomach, all the while serving healthy food, including at least 2 raw salads a day. He says that “You can save time and enzymes by eating raw foods,” and offers 5 easy ways to go raw. 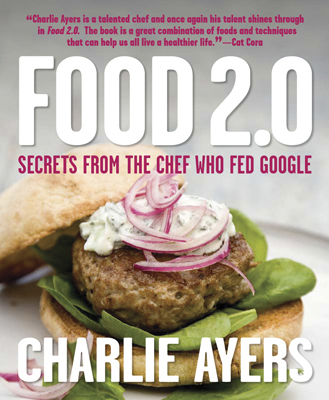 In Food 2.0, Charlie lays out what every cook should have in their pantry, with fun and interesting options. In fact, the book is laden with helpful hints and tips, whether you are a cook just starting out or an avid foodie who never leaves the kitchen. The whole first half of the book is actually just information – what condiments to stock, how to freeze meats and broths, and why you want to invest in a rice cooker. The second half is all recipes, which is what I am most excited about. And in keeping with the pro-health lifestyle that Charlie writes about, the recipes begin with yogurt, smoothies and fresh juices and shakes. The Wake-Up Shake-Me-Up Power Shake with black tea, rice milk, honey and strawberries? Now that’s how I want to start my day! And for lunch, I’m going to make his Dragon Breath Noodles with fresh egg noodles, peanut butter and chili flakes! Don’t worry, I’ve got gum for afterwards… And then there’s the Apple and Brie Quesadillas, Seattle Jim’s Pea Salad and Silicon Valley Split Pea Soup. This is what lunch should be like every day – fresh, invigorating and yet so very healthy. The dinner options are just as exciting – Lamb Burgers with Tzatziki Sauce, Snapper in a Yogurt Coat and Filet Mignon with Crisp Bacon, Seared Polenta and Wilted Spinach Salad. I am not afraid to say that there are bits of drool on some of these here pages now. I was trying to decide what to make for dinner. I think it’s down to the Wild Salmon and Warm Beet Salad, but it’s still early. I may yet go with Spinach Latkes and a salad or start all over again. The photos and layout make it completely enjoyable to flip through over and over. For some reason, maybe because he worked at Google and that says to me big corporation and lots of computers, I was expected a very different book – a more straight-ahead cookbook of standard recipes (read: boring and expected). But this is a lively, very of the moment book with a lighthearted, yet easy-to-follow guide of fresh recipes that are good for you and lots of advice that may just change the way you cook – and the way you eat. Before we get too deeply into the fall, let’s take a look at the red sensation — beets. 1. 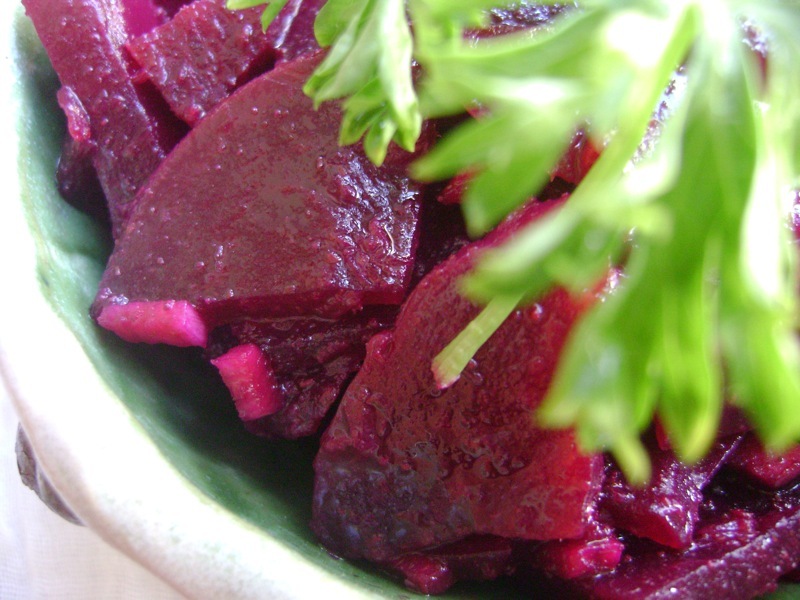 A recipe for Beetroot and Potato Salad. 2. Keep it simple: a Beet & Chevre Salad. 3. Nothing better than borscht: Svalbard Beet Soup with Goose Stock. 4. Try it raw: Grated Carrots & Beets. 5. Make it pink: Beet Gnocchi. Photo by Flickr user Ayala Moriel used under a Creative Commons Licence. Check out her beet salad recipe.